"Our mission at PS 39 is to create a school that cultivates a climate of continuous growth for all members of its community. Through reflective and responsive practice we will set and clearly communicate high expectations for our students and ourselves and effectively plan to help every child achieve success. We will teach and learn with passion and compassion, collaboratively creating a fully participatory learning environment that encourages conversation and exploration and celebrates the gifts and talents of each individual". In 1661, the Town of Breuckelen organized its first public school In a small church. Although the early schools were free, the Dutch, not wishing to accept "charity", insisted on paying an annual tuition of three to four guilders per child. The English, shortly after taking control In 1664, abolished this free school system. It was not until 1795 that New York State passed en act for "the encouragement of schools" which provided for appropriations from the State Treasury for education. In 1843, a law was enacted which established the Brooklyn Board of Education. By 1790, the early residents of the Gowanus section of Brooklyn, which includes today's Park Slope, had organized a school. Under the provisions of an 1805 law, the school district serving Gowanus elected trustees for the school in 1810. This school became known as Public School 2. By the 1870s, new facilities were needed to serve the Increasing student population. This problem was temporarily solved In the Gowanus section when Primary School 2 was organized as an outgrowth of Public School 2, In the house of Henry Bristow in 1873. Shortly afterward, in March of 1876, the Board of Education bought property at the corner of Sixth Avenue and Eighth Street from George Riggs to be the site of Public School 39. The school, which was begun in 1876, opened for classes In 1877 under the leadership of Its first principal, Harriet N. Morris. The pupils of Primary School 2 were transformed from the school in Henry Bristow's house to Public School 39 across the street. During the first year of classes at Public School 39, the student register swelled from about 300 students during the spring semester to approximately 840 students In the fall. Although the school had been designed for a capacity of 1,087 students, it did not accommodate that number of students until 1880. It is believed that Public School 39 was designed by Samuel B. Leonard who was the Superintendent of Buildings for the Board of Education at the time. It was modeled after Public School 37 which had been built the year before. Both buildings have nearly identical designs and display similar decorative detailing. One of the most distinctive features of the interior of Public School 39 was the division of each floor into two open spaces, each of which could be subdivided Into three classrooms by means of roiling doors. This concept of flexible classroom size became widely advocated during the 1960s.In 1963, Public School 39 was forced to remove its rolling doors in order to comply with fire code regulations. In 1916 the school was named after the late Henry Bristow (1840-1906), as part of a new citywide program to honor local civic leaders. Bristow was a local public administrator who had been elected the representative of the 6th Congressional District In 1900 and who had previously served as president of the 22nd Ward. In addition, Bristow was a member of the Brooklyn Board of Education during the 1880s end was appointed Police Justice in 1897. It is very fitting that Public School 39 be named in honor of so civic-minded an Individual as Bristow, in whose house Primary School 2 was first organized. As Public School 39 celebrates its 138th anniversary, it remains an important part of the Park Slope community. The school has been a source of community pride for generations and Is one of the few public schools of Its period which continues to serve its original function. This richly detailed three-story symmetrical school building is transitional in style combining features of the Italianate and French Second Empire styles. Each long side of the rectangular brick building has handsome two-tiered windows recessed between equal width well sections set above a base with conventional fenestration. The regular rhythm of these windows is broken at the center of each side by a two-story high projecting stair tower. The entrance or principal facade of the building facing Sixth Avenue is enriched by stone trim which contrasts with the brick. A central bay or tower with a rusticated first floor, which is the main feature of this facade, is flanked by high narrow corner pavilions with stone quoins at the first floor. Centered in this tower is the recessed main entrance doorway crowned by an arch with an ornamental keystone. At the second floor, above the main entrance, two high windows with corbeled heads are united under common lintel with end corbels. These windows, in turn, are surmounted by a high Venetian window of the type popularized In the Italianate style; a central column separates two arched windows with circular form above, and all are enframed by a single stone arch with faceted keystone. The spandrel panel between these tower windows bears the inscription "Public School 39". Flanking the tower, inside the paneled end bays, are a series of paired windows, segmental arched at the first floor and round arched at the upper two floors. Crowning the tower, where it projects above the roof, are three small arched windows above which is a band of diminutive corbeled arches set In the brickwork. Originally this central tower was crowned by a mansard roof, removed during the 1940s. On either side of the tower steep mansard roofs of slate with iron crestings extend out to meet the truncated pyramidal roofs above the end or corner pavilions at the Sixth Avenue end, while a low double-pitched roof covers the remaining length of the building behind the entrance facade. The mansard roofs are distinctive elements of the French Second Empire style. 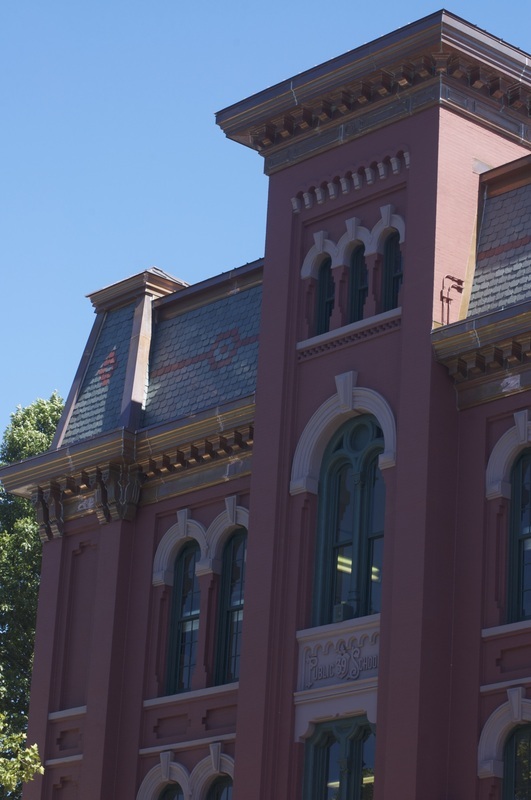 One of the most striking features of the school is its bold roof cornice with medallions and paired brackets so characteristic of the Italianate style. The cornice above the end pavilions is carried on the same paired grooved brackets as those which recur along the side walls.